Champlain travelled from Quebec to Tadoussac in June 1609 to meet his friend and colleague Pont Gravé, and learned from him that Sieur de Monts’s trade monopoly had not been renewed, making the St. Lawrence River more attractive to those who favoured free trade. Through private correspondence from de Monts, Champlain was ordered to return to France in the fall of 1609. When he received this news, Champlain determined to use his remaining time in New France to further establish positive relations with his Aboriginal colleagues. Champlain planned to join his Algonquin (Anishinabe), Huron (Wendat) and Montagnais (Innu) allies on a campaign against the Iroquois (Haudenosaunee) and, more specifically, the Mohawk near Ticonderoga in modern upstate New York. Champlain and his Aboriginal allies departed from Quebec on June 28, 1609. Early in July, they reached the mouth of the River of the Iroquois, today’s Richelieu River and, by the middle of July, arrived at a body of water that Champlain named for himself: Lake Champlain. Late in the evening of July 29, near Ticonderoga, Champlain and his two French and 60 Aboriginal allies encountered the Mohawk. They engaged in combat the following day. 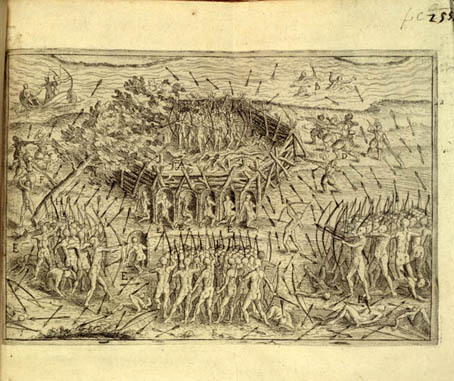 During the battle, fire from the French gun, or arquebus, took the Mohawk completely by surprise and was largely responsible for their defeat. This victory over the Mohawk further elevated Champlain’s status and strengthened alliances with his Aboriginal colleagues. Following the campaign, Champlain accompanied his Montagnais (Innu) neighbours to their villages to observe victory ceremonies. He then returned to Quebec and, following de Monts’s orders, prepared to depart for France. He arrived in France in October of 1609 and immediately sought an audience with King Henri IV to present gifts and report on his time in New France. Champlain also worked with Sieur de Monts to rally support among investors for the settlement at Quebec and further exploration of the region. This venture was successful and, after six months in France, Champlain returned to Quebec in the spring of 1610. Soon after his arrival, he again participated in a campaign against the Mohawk with his Aboriginal allies. They left Quebec and reached the lower Richelieu River on June 19, where they engaged in battle with the Mohawk. Although Champlain suffered arrow wounds to his ear and neck, the French and their Aboriginal allies emerged victorious. Following this campaign, the Mohawk posed little or no threat in the St. Lawrence Valley until 1634, in part because they turned their attention to the south to build trade alliances with the Dutch. Champlain returned to Quebec and began to prepare the settlement for winter and improve its fortifications against the threat of attack from the English and illegal traders. He also arranged for Étienne Brûlé, who had accompanied him to Quebec in 1608, to live with his Aboriginal allies in order to learn their languages and gain information about the interior of the continent. While initially he was to live with the Algonquin (Anishinabe) people, it seems that Brûlé ended up in the Georgian Bay/Lake Simcoe region of modern Ontario and lived with the Huron (Wendat) during the winter of 1610-11. During this period, Champlain received word of the assassination of King Henri IV and so quickly returned to France to secure continued support for New France at the French court. He was accompanied by a Huron (Wendat) man named Savignon, who was sent by his people to observe and report on what he saw in France.